You will also need ice cubes, and a strainer or large empty tea bags. This is How I Make Iced Tea, Fast! In this example, I make 6 cups of tea. I filled my empty tea bags with the leaves, but if you don’t happen to have tea bags, you can steep your tea loose and pour it through a strainer after! Next, I poured 3 cups of hot water over the tea bags. Let your tea steep. Don’t forget to cover your vessel! Your water temperature and steep time will vary, according to what kind of tea you use. I used an oolong, so I let my tea steep for 5 minutes. Once your tea is done steeping, remove the bags, or remove the leaves through a strainer. At this point, your tea is still hot, so if you’re a sweet tea kind of person, now is the chance to mix in your sweetener. Otherwise, skip this step. Then, add the cold water! I added 3 cups of cold water. And the final step, add some ice! 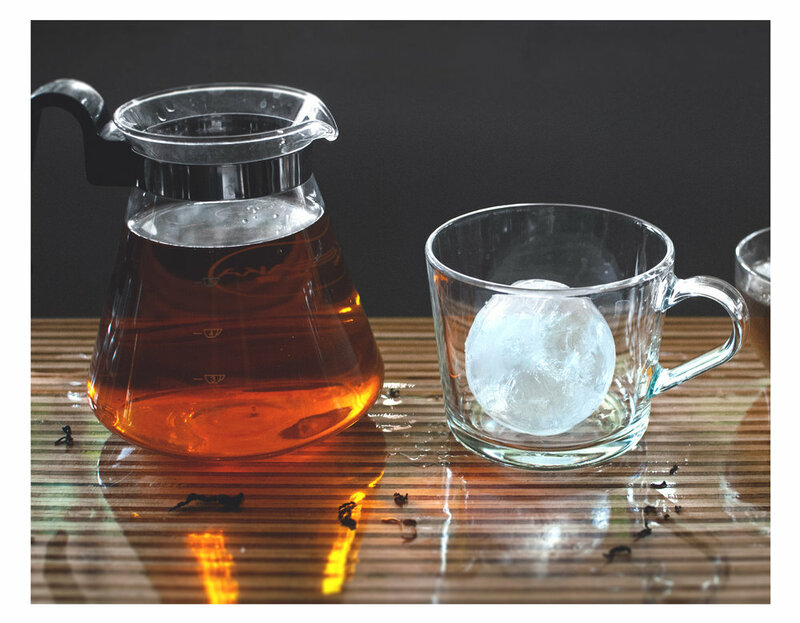 After adding the ice, begin swirling the iced tea as quickly (and as carefully) as you can: this is an important step, as it will affect how cold your tea gets. Swirl, swirl, swirl! Here’s another tip: while you’re making your tea, let your glasses chill in the freezer. And one more tip! Invest in sphere-shaped ice molds. The round ice keeps your drink cool, and melts slower, so your drink is less likely to become diluted.